Description: Lots of orange at North Colorado Springs this morning with the BNSF and DRGW making appearances. Description: Bookend ACe's on this passing coal train. Title: BNSF 9231 heads up a coal load. Description: BNSF train Z-STPCHC charges hard for Chicago saturday morning! Title: BNSF 9231 rocks a empty coal nb. 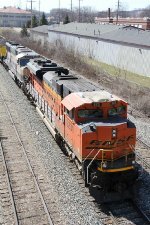 Description: A BNSF ACe leads a patched SP AC4400CW down the BNSF St. Joseph Sub. on a BNSF coal load. Description: A loaded ore train thunders over the former Soo Line route to Moose Lake Minnesota. The train has the attention of my 8 year old son. Description: Sitting in the US Steel Works Yard in Granite City, Illinois. Title: BNSF 6896 sits and waits for the ore train to be unloaded. Description: 2 Ace's work dpu on a empty coal train while the head end was 2 Mac's. Description: Unusual to see 3x2 power arrangements on the Scherer coal trains, its usually 2x2. Description: BNSF SD70ACe 9231 leads NS 733, and empty coal train heading west on the Central of Georgia district heading back to Memphis, TN. It has two SD70ACes leading and two as DPUs. Description: A C TUKC from Texas rolls past the Siloam Springs Amimal Shelter as it makes its way through town on the way to Wyoming for more coal. Description: BNSF SD70ACe sandwiched in the middle on CSX Q272-01 awesome to see this engine!